Mr. Aitch and I had an unwlecomed and uninvited guest swoop into our house Wednesday night. A sparrow to be exact. He (or she) was sitting on my front door decoration when Mr. Aitch went out on the front porch. As soon as the door opened, the sparrow made a beeline into our house. The bird flew into the family room and perched atop the entertainment center as Mr. Aitch and I figured out how to remove him/her without causing a major ruckus. We don’t have a big fishing net like my parents used to remove similar unwelcome and uninvited guests in their house. The only fishing net we have is for aquariums and it just wasn’t big enough for the job. While this brief discussion went on, the sparrow flew back and forth between the family room and kitchen taking in the view from atop the refrigerator then the entertainment center. Our plan was to open the door from the kitchen to the garage (which is right beside the refrigerator), turn on the garage light, open the garage door, and turn out all the lights in the house and hope that the bird would “go to the light”. The only presents the sparrow left for us were a few feathers. I took my fake-nest-and-flowers-in-a-basket decoration off the front door temporarily so we don’t have any more unwelcome and uninvited guests. 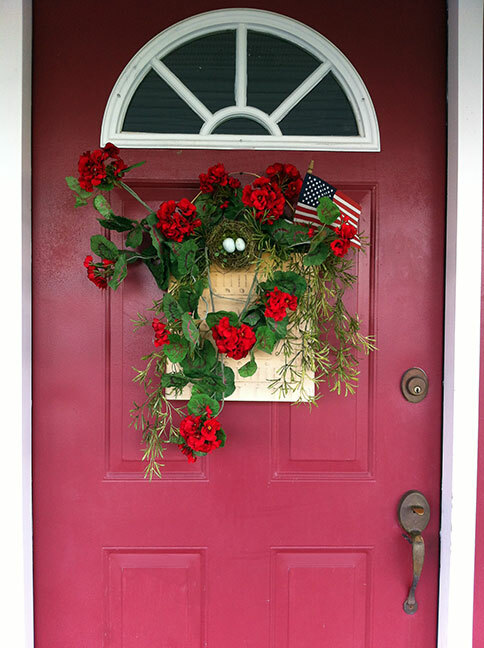 This entry was posted in decorating and tagged decorating, guest by Patti_is_knittinginflashes. Bookmark the permalink. I am glad the bird made it out safely, but sorry you had to take down that pretty decoration! I’ll put it back up in a week or so. I am glad he made it safely! Poor bird, and I like your decoration too! I guess the sparrow thought he/she found a new home!